vMotion over VXLAN is it supported? In vSphere 5.1 (and earlier) vMotion over VXLAN is not supported. This statement might change in the future, it could be that in the next version vMotion traffic over a VXLAN wire will be supported, but with the current release it is not. Do note that vMotioning virtual machines which are attached to a VXLAN network is supported. The next question people ask typically is, will it work? Yes it probably will, but again… it is not supported. Keep that in mind when you are designing a multi-site environment and want to use VXLAN. I have been getting so many hits on my blog for VXLAN I figured it was time to expand a bit on what I have written about so far. My first blog post was about Configuring VXLAN, the steps required to set it up in your vSphere environment. As I had many questions about the physical requirements I followed up with an article about exactly that, VXLAN Requirements. Now I am seeing more and more questions around where and when VXLAN would be a great fit, so lets start with some VXLAN basics. The first question that I would like to answer is what does VXLAN enable you to do? In short, and I am trying to make it as simple as I possibly can here… VXLAN allows you to create a logical network for your virtual machines across different networks. More technically speaking, you can create a layer 2 network on top of layer 3. VXLAN does this through encapsulation. Kamau Wanguhu wrote some excellent articles about how this works, and I suggest you read that if you are interested. (VXLAN Primer Part 1, VXLAN Primer Part 2) On top of that I would also highly recommend Massimo’s Use Case article, some real useful info in there! Before we continue, I want to emphasize that you could potentially create 16 million networks using VXLAN, compare this to the ~4000 VLANs and you understand by this technology is important for the software defined datacenter. Where does VXLAN fit in and where doesn’t it (yet)? First of all, lets start with a diagram. 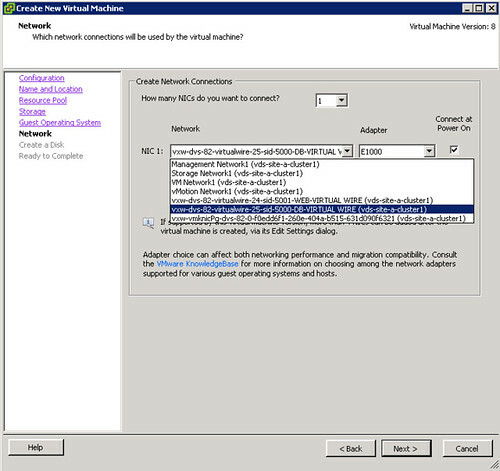 In order for the VM in Cluster A which has “VLAN 1” for the virtual machine network to talk to the VM in Cluster B (using VLAN 2) a router is required. This by itself is not overly exciting and typically everyone will be able to implement it by the use of a router or layer 3 switching device. In my example, I have 2 hosts in a cluster just to simplify the picture but imagine this being a huge environment and hence the reason many VLANs are created to restrict the failure domain / broadcast domain. But what if I want VMs in Cluster A to be in the same domain as the VMs in Cluster B? Would I go around and start plumbing all my VLANs to all my hosts? Just imagine how complex that will get fairly quickly. So how would VXLAN solve this? The VTEPs are responsible for encapsulating the virtual machine traffic in a VXLAN header as well as stripping it off and presenting the destination virtual machine with the original L2 packet. This allows you to create a new network segment, a layer 2 over layer 3. But what if you have multiple VXLAN wires? How does a VM in VXLAN Wire A communicate to a VM in VXLAN Wire B? Traffic will flow through an Edge device, vShield Edge in this case as you can see in the diagram below. 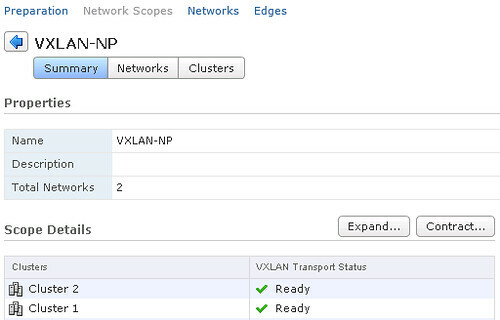 So how about applying this cool new VXLAN technology to an SRM infrastructure or a Stretched Cluster infrastructure? Well there are some caveats and constraints (right now) that you will need to know about, some of you might have already spotted one in the previous diagram. I have had these questions come up multiple times, so hence the reason I want to get this out in the open. In the current version you cannot “stitch” VXLAN wires together across multiple vCenter Servers, or at least this is not supported. In a stretched cluster environment a VXLAN implementation could lead to traffic tromboning. So what do I mean with traffic tromboning? (Also explained in this article by Omar Sultan.) Traffic tromboning means that potentially you could have traffic flowing between sites because of the placement of a vShield Edge device. Lets depict it to make it clear, I stripped this to the bare minimum leaving VTEPs, VLANs etc out of the picture as it is complicated enough. 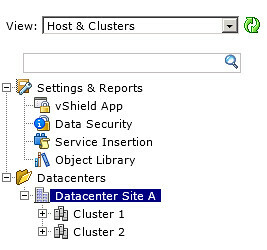 In this scenario we have two VMs both sitting in Site A, and cluster A to be more specific… even the same host! Now when these VMs want to communicate with each other they will need to go through their Edge device as they are on a different wire, represented by a different color in this diagram. However, the Edge device sits in Site B. So this means that for these VMs to talk to each other traffic will flow through the Edge device in Site B and then come back to Site A to the exact same host. Yes indeed, there could be an overhead associated with that. And with two VMs that probably is minor, with 1000s of VMs that could be substantial. Hence the reason I wouldn’t recommend it in a Stretched environment. Before anyone asks though, yes VMware is fully aware of these constraints and caveats and are working very hard towards solving these, but for now… I personally would not recommend using VXLAN for SRM or Stretched Infrastructures. So where does it fit? I think in this post there are already a few mentioned but lets recap. First and foremost, the software defined datacenter. Being able to create new networks on the fly (for instance through vCloud Director, or vCenter Server) adds a level of flexibility which is unheard of. Also those environments which are closing in on the 4000 VLAN limitation. (And in some platforms this is even less.) Other options are sites where each cluster has a given set of VLANs assigned but these are not shared across cluster and do have the requirement to place VMs across clusters in the same segment. Recommend to have DHCP available on VXLAN transport VLANs, fixed IP also works though! Strongly recommended to have IGMP snooping enabled on L2 switches to which VXLAN participating hosts are attached. IGMP Querier must be enabled on router or L3 switch with connectivity to the multicast enabled networks when IGMP snooping is enabled. The recommended Multicast protocol to deploy for this scenario is Bidirectional Protocol Independent Multicast (PIM-BIDIR), since the Hosts act as both multicast speakers and receivers at the same time. That should capture most requirements and recommendations. If anyone has any additions please leave a comment and I will add it. Yesterday I got an email about configuring VXLAN. I was in the middle of re-doing my lab so I figured this would be a nice exercise. First I downloaded vShield Manager and migrated from regular virtual switches to a Distributed Switch environment. I am not going to go in to any depth around how to do this, this is fairly straight forward. Just right click the Distributed Switch and select “Add and Manage Hosts” and follow the steps. If you wondering what the use-case for VXLAN would be I recommend reading Massimo’s post. VXLAN is an overlay technique and encapsulates layer 2 in layer 3. If you want to know how this works technically you can find the specs here. I wanted to create a virtual wire in my cluster. Just assume this is a large environment, I have many clusters and many virtual machines. In order to provide some form of isolation I would need to create a lot of VLANs and make sure these are all plumbed to the respective hosts… As you can imagine, it is not as flexible as one would hope. In order to solve this problem VMware (and partners) introduced VXLAN. VXLAN enables you to create a virtual network, aka a virtual wire. This virtual wire is a layer 2 segment and while the hosts might be in different networks the VMs can still belong to the same. An agent will now be installed on the hosts in your cluster. This is a “vib” package that handles VXLAN traffic and a new vmknic is created. This vmknic is created with DHCP enabled, if needed in your environment you can change this to a static address. Lets continue with finalizing the preparation. Now that we have defined our virtual network boundaries aka “network scope” we can create a virtual wire. The virtual wire is what it is all about, a “layer 2” segment. Now if you had a virtual wire, and it needed to be connected to an Edge (more than likely) make sure to connect the virtual wire to the Edge by going back to “Networks”. Select the wire and then the “actions dial” and click “Connect to Edge” and select the correct edge device. Now that you have a couple of wires you can start provisioning VMs or migrating VMs to them. Simply add them to the right network during the provisioning process.